FlexFrame has a rubber torsion compartment built into the A-Frame assembly allowing a snowplow to follow the plowing surface and maintain contstant down pressure on the snow plow's cutting edge. UltraPlow and QuattroPlow Series snow plows from Burnsville-based SnowWolf are now available with an optional redesigned A-frame that allows the plow to float up and down with the contours of a surface while maintaining consistent, effective down pressure on the plowing surface. This new performance add-on feature is known as the FlexFrame. The original A-frame design is rigid, which means the snowplow's moldboard is a fixed construction that'll always be at a constant elevation. When there are dips or low areas, the cutting edge would typically leave the plowing surface due to lack of vertical travel. To combat this problem, skid steer operators would simply tilt the machine up taking the front wheels off the ground to provide greater down pressure on the blade. The problem with doing that is the operator will lose grip by exerting all the forward drive to the back wheels only limiting traction. With a wheel loader or tractor, this method is all-together impossible because the operator would lose steering and overall control of the machine. The new FlexFrame design allows the plow to rise and fall with all the machine's wheels riding on the ground, resulting in a cleaner surface and greater traction. Like all SnowWolf plow attachments, the UltraPlow and QuattroPlow have the ability to oscillate side to side to follow most surfaces. With the floating design of the FlexFrame and the oscillation feature combined, the cutting edge remains in full contact with the plowing surface without any input from the operator. “With the introduction of the QuattroPlow, the need for a floating moldboard quickly became apparent,” SnowWolf President and Product Development Manager Jerry Holman said. To address the issue, SnowWolf incorporated semi-floating torsion technology that it previously incorporated into its FlexPlow. The FlexFrame system gives the equipment operator the ability to apply variable down pressure on the blade, from zero foot-pounds of pressure on up to as much as 1,500 ft. lbs. by rolling the attachment plate forward or backward — the system either exerts or releases pressure from the blade's cutting edge. The torsion system also flexes to provide cushioning in the event of an obstacle strike and provides built-in shock absorption when traveling between projects. Rather than bouncing metal to metal on a rigid frame, the weight of the UltraPlow or QuattroPlow rests securely on the torsion system. 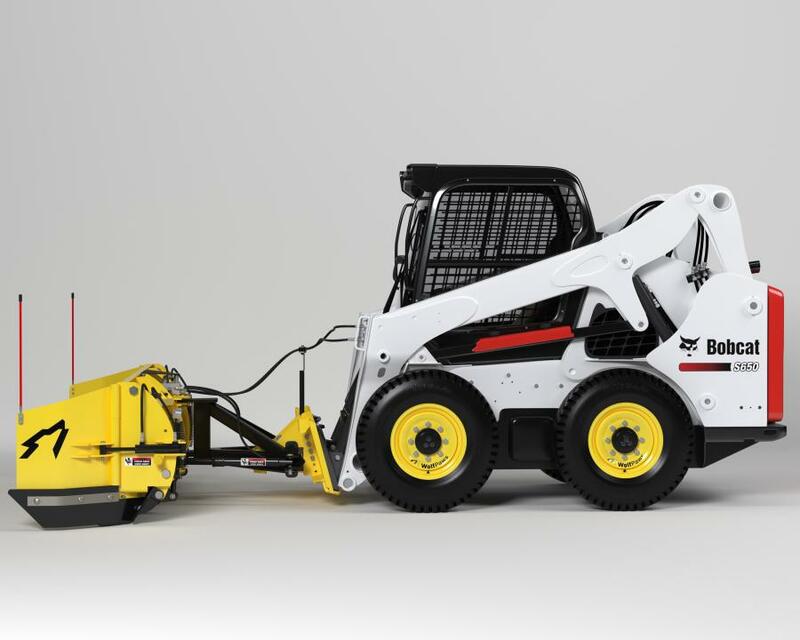 SnowWolf designed the new A-frame so independent contractors and fleet managers won't need to purchase entirely new attachments to get the floating functionality. 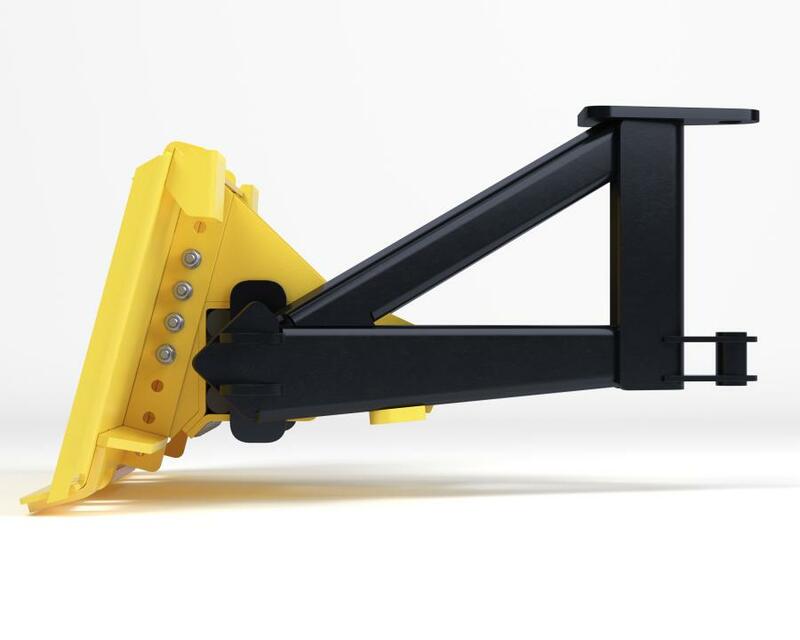 Customers who already own an UltraPlow or QuattroPlow can quickly and easily replace their frames by pulling two pins, removing the cylinders, setting the old frame aside, placing the new floating frame, reattaching the cylinders and reattaching the plow. The UltraPlow has been a stalwart of SnowWolf's snow removal product offering since it formed in 1992. The company introduced the QuattroPlow in 2016 for machines that weigh 6,000 to 14,000 lbs., like skid steers, compact wheel loaders and smaller tractors with loaders. The technologically advanced QuattroPlow gives operators the power to efficiently tackle four distinct functions with one piece of equipment. It's a high-capacity, hydraulic angle snow pusher, angle plow with wings, wide-angle plow with wings and back drag plow, all in one. Operators can switch from one type of plowing to another in seconds without leaving the cab or even pushing a button, and no extra electric harnesses or controllers are required. They also can set the plow for a fifth function — wide-angle plowing — in 60 seconds or less by leaving the cab to reposition the wing cylinders so the wings only rotate back 90 degrees. SnowWolf, a WolfDesign company, is a family-owned snow removal equipment manufacturer based in Burnsville, Minn. The Holman family started SnowWolf in 1992 after working as landscaping, lawn care and snow removal contractors for many years. The company develops intelligently designed, professional-grade snow removal equipment such as straight plows, box pushers and snow blowers, attachments like its FastTach™, QuattroPlow, UltraPusherTE and WolfWings, as well as accessories like its unique WolfPaws tires for skid steers. SnowWolf solutions make operations ranging from individual contractors to large fleets more efficient and profitable. In addition to developing innovative products, the company provides industry-leading customer care and service. For more information, call 800/905-2265 or visit snowwolfplows.com.